Our customers depend on our ability to listen and solve whatever problems they face. From KanBan—JIT schedules to bar coding, to making seemingly impossible delivery times, our customers know they can pick up the phone, set All-New Stamping into motion and count on proven results. Our Engineering, Production and Quality Control Departments maintain a free flow of coordinated communication to help guarantee and maintain the highest quality product. Our personal approach includes economical purchasing practices based on years of experience with suppliers who meet the demanding standards we require, even beyond those of our customers. All of our customers count on All-New personal attention, whether they need one part or one million. Our sales team, like our engineering staff, is thoroughly versed in the art of power satisfaction. They are resourceful, expedient, and ready to serve. 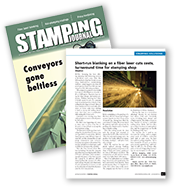 One of the most rewarding benefits of working at All-New Stamping is that I get to develop long-term relationships with customers who depend on us for the consistent delivery of products that exceed their needs. Delivering products at a value that exceeds their expectations. Long-term customers... how do you get those in an era of profound change and very few real loyalties? With satisfying experiences over and over and over again. We call that power satisfaction, but it’s much more than an advertising phrase. It’s a real factor in how we retain and build our customer base. There’s a box with some of the elements of this phenomenon elsewhere in this website, but let me reduce it to simple English. We build our business by keeping you happy. Whatever it takes. I’m proud to be part of the All-New Stamping team. Let us show you today what power satisfaction can mean to you.